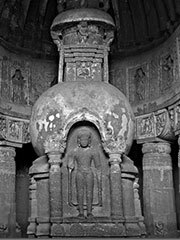 A chaitya is a type of Jain or Buddhist shrine. In Jainism, specially in Taran Panth, the terms chaitya or chaityalaya are still used, often to designate small temples. Chaityavasi Jain monks used to live in the compounds of Jain temples. A chaitya-griha Buddhist cave (stupa hall) is a meeting or assembly chamber often used for purposes similar to a stupa. In fact, it is not uncommon to find a stupa situated inside the interior space of a chaitya. They are largely associated with Buddhism. Architecturally they show similarities to Roman design concepts of column and arch. Chaitya-grihas were probably constructed to accommodate large numbers of devotees and to provide shelter for them (Mitra 1971). Early chaitya-grihas, such as at Bijak-ki-pahadi in Bairat which is ascribed to the emperor Ashoka, were built as standing structures with the stupa being surrounded by a colonnaded processional path enclosed by an outer wall with a congregation hall adjoining it (Mitra 1971). The more spectacular and more numerous chaitya-grihas, however, were cut into living rock as caves. This practice has had a long tradition in Hinduism and was taken up by Buddhists in the first century BCE. The earliest rock-cut chaitya-grihas, similar to free-standing ones, consisted of an inner circular chamber with pillars to create a circumambulatory path around the stupa and an outer rectangular hall for the congregation of the devotees. Over the course of time the wall separating the stupa from the hall was removed to create an apsidal hall with a colonnade around the nave and the stupa (Dehejia 1972). The chaitya-griha at Bhaja was constructed in the first century BCE. It consisted of an apsidal hall with stupa. The columns sloped inwards in the imitation of wooden columns that would have been structurally necessary to keep a roof up. The ceiling was barrel-vaulted with wooden ribs set into them. The walls were polished in the Mauryan style. It was faced by a substantial wooden facade. A large horseshoe-shaped window, the chaitya-window, was set above the arched doorway and the whole portico-area was carved to imitate a multi-storeyed building with balconies and windows and sculptured men and women who observed the scene below. This created the appearance of an ancient Indian mansion (Dehejia 1997). In Bhaja, as in other chatya-grihas, the entrance acted as the demarcation between the sacred and the profane. The stupa inside the hall was now completely removed from the sight of anyone outside. In this context, in the first century CE, the earlier veneration of the stupa now changed to the veneration of an image of the Buddha. Chaitya-grihas were commonly part of a monastic complex, the vihara. Dehejia, V. (1972). Early Buddhist Rock Temples. Thames and Hudson: London. ISBN 0500690014. Dehejia, V. (1997). Indian Art. Phaidon: London. ISBN 0714834963. Mitra, D., 1971. Buddhist Monuments. Sahitya Samsad: Calcutta. ISBN 0896844900.